Wealth is critical to families’ immediate and long-term economic well-being. It helps families pay their bills if their income drops due to unforeseen events such as a layoff or medical emergency. It also allows them to invest in their future by sending their children to college; moving to a desirable neighborhood due to, for instance, better schools; switching jobs; or starting a business. Yet wealth is highly unequally distributed in the United States—particularly by race and ethnicity. (see Appendix for more information) White families, for instance, have significantly more wealth than nonwhite families.1 There are a few institutions that help shrink this systematic divide; unions are one such institution. Unions help increase the wealth for all workers. Indeed, previous Center for American Progress Action Fund research showed that a typical worker covered by a union contract has roughly twice the wealth of a typical nonunion worker.2 And new Center for American Progress analysis shows that unions boost wealth the most for those who are nonwhite. Being a union member creates a number of venues for workers to build more wealth than would be available for nonunion members.4 Union members bargain collectively for wages, benefits, and procedures that affect their employment, such as when and how an employer can fire an employee. As a result of being covered by a collective bargaining agreement—the contract that employers and unions regularly sign and that governs these employment-related issues—union members have higher wages, on average; more benefits; and more stable employment than is the case for nonunion members. The data suggest that nonwhite union members receive a particular boost in their wealth because they see larger increases in pay, benefits, and employment stability than white union members. This is primarily a result of the fact that nonwhite workers work more frequently than whites in low-paying jobs with few benefits, so they often have much more to gain.10 This disparity in working conditions is due to a wide array of factors, including but not limited to unequal access to education, occupational segregation, and discrimination.11 Unions help all workers, and they do the most for those with less advantages. As a result, union membership can help shrink that racial gap in labor market outcomes. And this partial equalization translates into a boost in median wealth for nonwhite union families. The racial wealth gap narrows when union membership increases because the wealth gap between union and nonunion members is greater among those who are nonwhite than among whites. 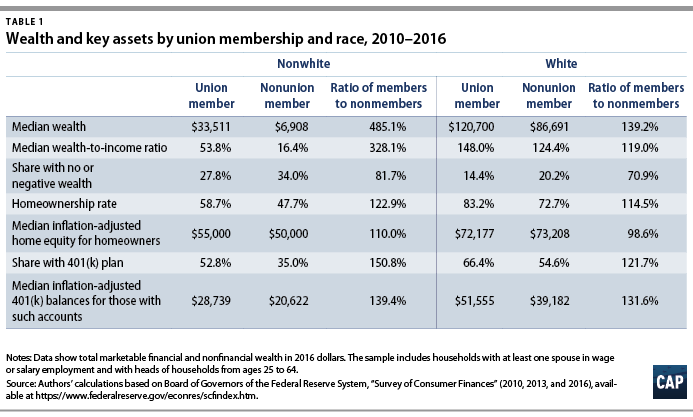 (see Table 1) Nonwhite union members had almost five times the median wealth of their nonunion member counterparts from 2010 to 2016. White union members, however, had only 39 percent more median wealth than white nonunion members during the same years. 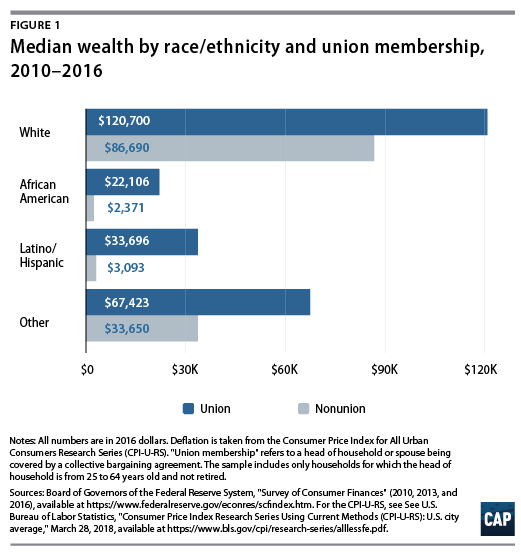 This pronounced difference in median wealth reflects the fact that the majority of nonwhite union members have key assets—such as homeownership and retirement plans—while most nonunion members do not. From 2010 to 2016, 58.7 percent of nonwhite union members were homeowners, and 52.8 percent had a 401(k) plan. (see Table 1) In comparison, nonunion members had a homeownership rate of 47.7 percent, and only 35 percent had a 401(k) plan. Because union membership increases one’s likelihood of having these key assets by more than 50 percent (see Table 1), there is a pronounced jump in median wealth associated with union membership. This is less the case for whites: White union members are more likely to own their homes and have a 401(k) plan than white nonunion members, but the majority of white union and nonunion members are homeowners and have 401(k) plans. In other words, not only is the increase in owning key assets that is associated with union membership greater among nonwhite families, but it also broadens the typical nonwhite household wealth to include housing and retirement savings. 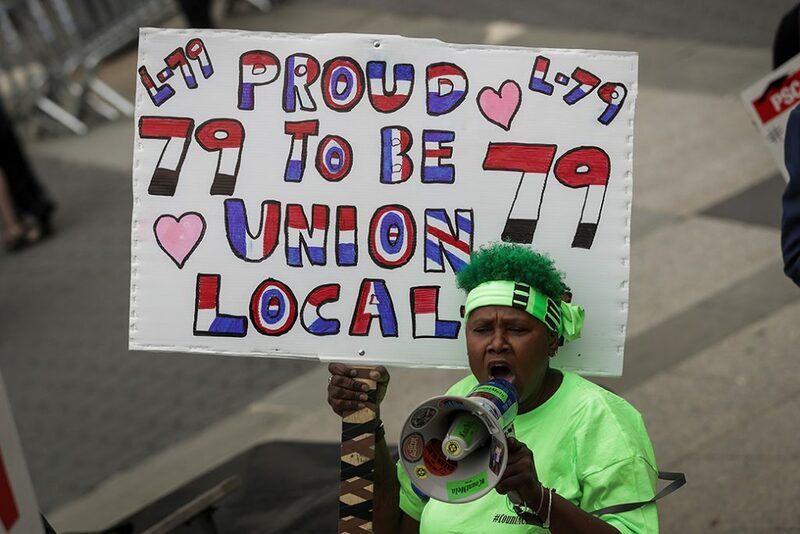 An equalizing force, union membership brings greater rewards—and wealth—for nonwhite workers than it does for white workers. Household wealth depends on families’ income and, relatedly, on their savings—for example, in the form of 401(k) plans. It also depends on having employee benefits such as health insurance, which allow families to save more since many of life’s risks are insured, as well as on employment stability, so families can better concentrate on saving for the future. 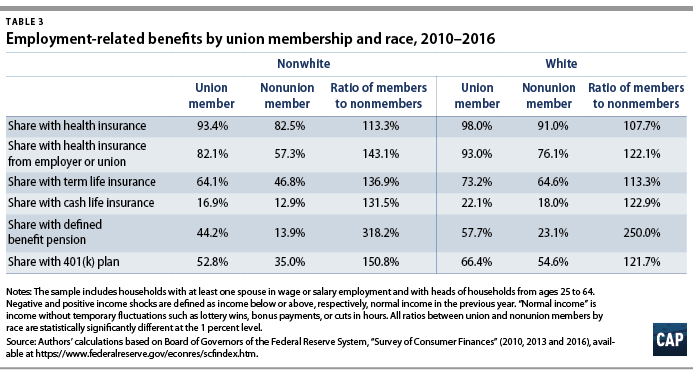 The data below show that union members—regardless of race or ethnicity—have higher incomes, more savings, more benefits, and greater employment stability than nonunion members. The difference in income, savings, benefits, and employment stability between union members and nonunion members is greater among those who are nonwhite than among whites. That is, union membership provides a more significant boost to the overall economic security of nonwhite families than it does to whites families. These union-related gains translate into a larger jump in wealth for nonwhite families than for white families. Importantly, nonwhite families’ gains from union membership outweigh those of the average white union member family because nonwhite workers tend to work in jobs with lower pay, fewer benefits (see Table 3), and less stability (see Table 4) to begin with, as well as experience greater economic insecurity. Union membership helps narrow such stark racial and ethnic inequities. Table 2 shows income, annual wages, and 401(k) contributions by union membership and race. Contributions to 401(k) plans are reported here, as they may be related to earnings. Workers with higher earnings have more tax incentives to save in such plans. The data show that union households have higher incomes and more wages than nonunion households. This difference in income and wages is especially large for nonwhite families: Whereas nonwhite union members’ wages are 41.5 percent greater than those of their nonunion member counterparts, white union members’ wages are 26.3 percent greater than white nonunion members’ wages. (see Table 2) The data show no meaningful differences relative to earnings in contribution rates to 401(k) plans by union membership. However, because union members’ wages are higher than those of nonunion members, their 401(k) contributions are also higher. These additional contributions help explain the larger median account balances among union members with 401(k) plans than among nonunion members with 401(k) plans. The data in Table 3 summarize employment-related benefits by race and union membership.12 Union members are more likely than nonunion members to have health insurance, especially from their employers, as well as to have life insurance and retirement benefits—both defined benefit pensions and 401(k) retirement savings plans. Again, the gap by union membership is larger among those who are nonwhite than among whites. The likelihood of having a 401(k) plan, for example, is 50.8 percent greater for nonwhite union members than for their nonunion counterparts, compared with the 21.7 percent gap for whites. Union members also enjoy more income and employment stability. Among union members, the chance of experiencing a negative income shock is smaller, the chance of experiencing a positive income shock13 is greater, and the length of time somebody has been employed by the same employer—a key measure of employment stability—is greater than among nonmembers. (see Table 4) Moreover, the differences in positive income shocks and tenure with current employer are more pronounced among nonwhite families than among white families. The gap in tenure, for instance, is 57.9 percent among nonwhites, compared with 43.5 percent among whites. Union membership helps families build more wealth by giving them more access to better-paying, more stable jobs with better benefits. These gains from being covered by a collective bargaining agreement give families more resources to focus on long-term savings goals. Importantly, the gains from union membership in terms of pay, benefits, and stability are more pronounced among nonwhite families than among white families, so the wealth difference by union membership is greater among those who are nonwhite than among whites. The opportunity to improve middle-class economic security and reduce wealth inequality in the United States exists. Allowing more workers to join a union will eventually narrow today’s wealth gap. Specific policy steps could include providing virtually all workers with the right to join a union and bargain collectively, ensuring that these rights are adequately protected, encouraging collective bargaining at the industry or the regional level, and strengthening funding streams for unions. To achieve these goals, the Center for American Progress supports a number of reforms proposed in Congress, including the Workplace Action for a Growing Economy (WAGE) Act and the labor policies in the Better Deal agenda.14 Unfortunately, Republicans in Congress and state houses—as well as Republican appointees on the Supreme Court, through actions such as the recent Janus decision—are pursuing policies to make it harder for workers to join together in unions. These efforts, fueled in significant part by hyperpartisanship and the interests of very wealthy donors and powerful corporations, will cause the racial wealth gap to grow. A reversal of these anti-union efforts and a new commitment to supporting workers and unions would go a long way toward helping reduce the gross racial wealth inequities demonstrated in this analysis. Christian E. Weller is a senior fellow at the Center for American Progress and a Professor of Public Policy at the McCormack Graduate School of Policy and Global Studies at the University of Massachusetts, Boston. David Madland is a senior fellow at the Center. This brief relies on data from the Federal Reserve’s triennial Survey of Consumer Finances (SCF), a nationally representative survey of U.S. household wealth. The SCF includes comprehensive information on household wealth, including all assets and debt. It also contains information on savings behavior, such as contributions to retirement accounts, and on income and financial information that households may use to make decisions. The SCF also includes data on household characteristics such as marital status, occupation, industry, and union membership of either spouse. The SCF contains consistent information for most of the brief’s variables of interest since 1989, providing 10 survey years through 2016. The primary measure of interest is wealth. Wealth is defined as the difference between marketable assets and debt. The calculation of wealth excludes cars, however, along with other consumer durables such as refrigerators, as they are often highly illiquid and depreciate quickly. It also exclude the imputed pension wealth for those covered by defined benefit (DB) pensions. Excluding DB pension wealth means that the calculations understate the impact that unions have on wealth because union members are much more likely than nonmembers to have a DB pension. To test the robustness of this brief’s conclusions, the discussion also uses wealth-to-income ratios and the chance of having no or negative wealth. Analyzing gaps in wealth-to-income ratios in addition to differences in wealth captures whether and how union households trade off income and benefits. Furthermore, for ease of discussion, the term “union members” refers to those workers who indicate that they are covered by a collective bargaining contract. Since households are the unit of analysis, a married union household is one where either spouse is covered by a collective bargaining agreement. The use of household wealth—as opposed to individual wealth—further understates the impact that unions may have on wealth, as, for instance, a union household may have a nonunion head of household. The brief then uses several variables to capture three possible explanations for any observed wealth differences by union membership. It first shows income and wages, as increased bargaining power leading to higher earnings is a main way in which unions may contribute to higher wealth. Second, the tables show a range of benefits, including participation in a workplace retirement plan and employer-provided health insurance. Such benefits constitute a significant source of wealth for the typical worker and make it easier for families to save for long-term goals. Third, the tables include measures of employment and income stability. They specifically include the length of employment with the current employer as an indicator of employment stability. The calculation uses the tenure of the head of household in married, nonunion households and the tenure of the union member in married union households to capture the difference in tenure by union membership.15 Furthermore, the SCF asks respondents whether their household income in the previous year was below or above their normal level or whether it was at its normal level. The tables then calculate the chance of having had incomes in the previous year below normal levels and incomes above normal levels as measures of income volatility. Negative income volatility can result not only from the loss of a job but also from unexpected changes in work hours.